The plants in a pond ecosystem are often classified as weeds by botanists, but this does not mean that they do not serve valuable purposes in the environment. Many provide valuable services to the ponds in which they grow. Without the proper mix of plants in a pond, the ecosystem can suffer greatly, harming the wildlife in and around the pond. Many plants remove carbon dioxide from the water and replace it with fresh oxygen. This process is essential for the health of the pond’s ecosystem, allowing aquatic life such as fish to thrive. American elodea is such a species, according to the U.S. Department of Agriculture. This plant, known as waterweed, remains submerged with only the tiny white flowers it produces breaking the surface. In addition to providing oxygen to water life, elodea also gives fish and animals like turtles good cover. Coontail, also called hornwort, favors ponds with slightly acidic water. It can develop in a wide range of conditions and is a good oxygenating species. Coontail does not grow above the surface, nor does it possess roots in most cases. Coontail has long stems with forked branches. The tips of the branches have so many leaves that they resemble the tail of a raccoon in terms of their shape. Other types of oxygenating pond plants include species such as blood stargrass, ambulia, cabomba, Brazilian pennywort, hygrophila and foxtail. Marginal plants grow along the edges of a pond. These species are important in terms of landscaping, but many are vital to the pond’s ecosystem, drawing excess nutrients from the water. Also called bog plants, they grow on the damp soil near the pond or develop in the shallows and extend above the water’s surface. Pickerelweed is a typical marginal, growing in the water and extending some 3 to 6 inches above the surface. Spear-shaped foliage is a feature of pickerelweed, which produces a showy purple flower from June through mid-summer. Water primrose is another valuable bog plant, growing along the shoreline and often producing runners that can wind up floating along the surface. The leaves of water primrose have a lance point shape or they are narrow and long like those of a willow tree. 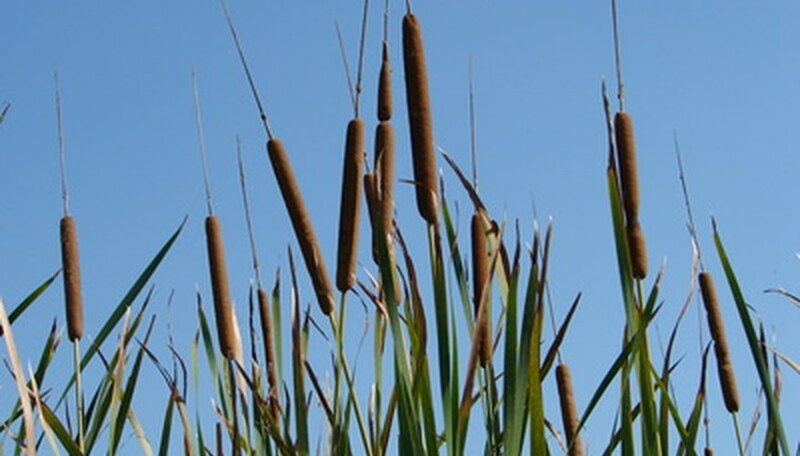 Other marginals you can plant along the edges of a pond to enhance the ecosystem include cattails, arrowhead, rushes and reeds, dwarf papyrus, yellow buttons, mares tail and pennywort. These plants can provide habitat for many bird species as well as produce seeds that waterfowl will eat. Floating plants in a pond are important, as too few can result in harmful algae, as light that floating plants would block precipitates algal growth. Too many floating plants can create stagnant water, choking the pond, depleting it of oxygen. Floating plants may be free-floating, such as the non-native water hyacinth. It produces an attractive and colorful flower, but its main benefit is to remove excess nutrients and harmful toxins like ammonia and heavy metals from a pond. Water hyacinth, according to the “National Audubon Society Field Guide to Wildflowers,” has a reputation of clogging waterways, so it is important to restrict it to a pond and not allow it to escape into open waters. Floating plants with their roots in the mud at the bottom of a pond also help the ecosystem. One is water shield, nicknamed dollar bonnet. Water shield is a perennial, coming back each year and featuring oval small leaves, about 5 inches wide at the maximum, which attach to a stalk rooted into the mud. The leaves lack a slit in them, are oval and they float on the pond’s surface. The undersides possess a thin coating of slime and are purple, as are the stems. The tops of water shield are green; the flowers are small with a dull purple hue. Other floating pond plants include species like water lily, parrot feather and water lettuce.